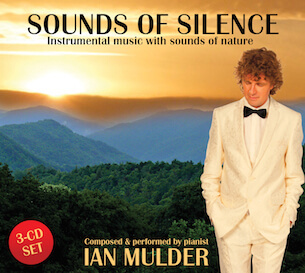 Ian Mulder celebrates his 20th Anniversary as a composer and recording artist with a Super Deluxe 3-CD Box Set titled: Sounds of Silence. The award-winning pianist composed and arranged over 1200 pieces of music and recorded 275 different albums with countless artists and orchestras including The London Symphony Orchestra and The Moscow Symphony Orchestra. The new 3-CD Box Set offers the most beautiful 30 compositions for piano and orchestra which he recorded in the past 20 years. For this project he combined his music with gorgeous sounds of nature. The Special Anniversary Price for this unique collector's item is only $24,99 plus shipping.